Look at This Obscene Vintage Watch!!!! Oh my God, this watch is so rude! Of course, on one side—as the YouTube video via Digg explains—it’s a rather bucolic scene. An obliging woman about to burst from her top pumps water from the local well for a man passing by with a thirsty horse. Nothing too risqué there. However, flip it over and release the back panel and you’ll find a man pumping away and it’s not at the local well. 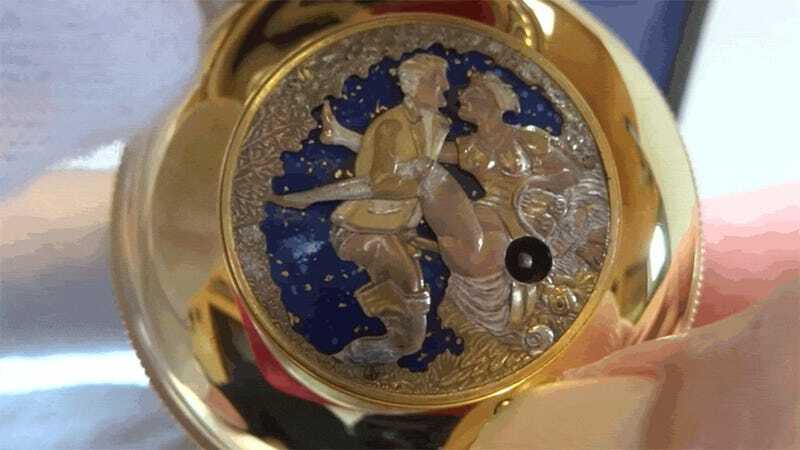 Despite my immediate assumption that some wicked old 18th century roué was responsible for this creation, the expert who made the video says its circa the 1980s. But no doubt there is a libertine’s ghost hovering over your shoulder right now, positively crushed he didn’t get the chance to own this dirty thing.